Soffits are boards used to close off the underside of common rafters when used in roof construction. Also known as soffit boards, they are mostly fixed horizontally but occasionally they can be fixed directly to the underside of the common rafter in which case they are known as sloping soffits. Soffit boards can be plain or vented. 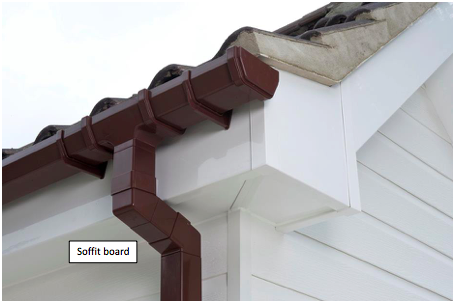 Vented soffit boards are boards with a series of slots running through their length and it is these vented slots that allow air flow into the roof space. Where air flow to the roof is channeled by alternative means solids soffit boards are used. Other things to consider when selecting your new soffit board would be the width of board and surface finish. For example, you may require a woodgrain soffit board or a smooth UPVC soffit board.